If you have always dreamed of flying a helicopter, now’s the time to do it – with this Trial Introductory Helicopter Flight at Ballina Byron Gateway Airport. Looking for a truly unique experience? Thought of becoming a helicopter Pilot? Then this is the flight for you. 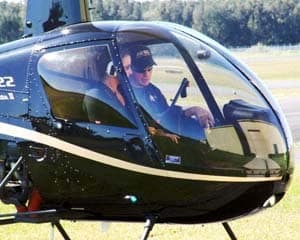 A trial introductory flight with one of our qualified helicopter instructors is a truly unforgettable life experience. Firstly you are briefed on how the helicopters controls are operated and the effect that these controls have while the helicopter is in flight. Then following a safety briefing you and the instructor head out in our dual controlled helicopter where you will be introduced to each flight control one by one, finally the instructor will have given you all the controls and you will find yourself flying the helicopter back towards the airfield. On return your instructor with provide you with a demonstration of the helicopters amazing capabilities.This is an awesome experience! This more flight provides an individual a fantastic insight into the responsibilities of being a pilot and is an amazing rush. Your palms are guaranteed to be sweaty on this adventure!